After a good day at a celebratory barbecue for a friend who not only got his MD but also won a statewide “outstanding graduate student” award, I went over to Arto’s last night to edit a fascinatingly bizarre “creative project” I’m doing where my lab group and I pretend to be news reporters from the neuromuscular junction. Yep, that’s how they’re training the future medical leaders of the world, folks! 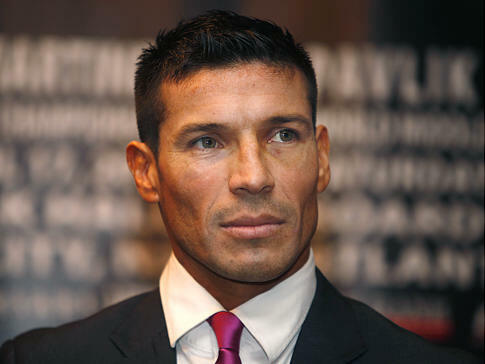 Amb, I see your Michael Douglas and I raise you world middleweight champion Sergio Martinez. … drank some Quilmes beer (from the Argentinean hometown of my favorite boxer, Sergio Martinez) and logged on to Sporcle for some brain-teasing puzzles. Some were enjoyable but easy (a U.S. Presidents quiz… I can do that in my sleep), some were frustrating (you try to identify U.S. states by a partial picture of their county maps! ), or truly quite dull (it’s amazing how un-interesting the 100 most common English words are). However, we stumbled on to a pretty amazing one about literature and movie before and afters that inspired today’s post and had me thinking hard all the way home about ways to segue the idea into a blog post. For these ones, we will be combining a name profiled in a previous post on the Blog of Funny Names, and some reference to famous pop music from the 1960’s until the present day. Post your answers in the comment section to gain our everlasting respect and admiration. Don’t worry about checking what others have posted… in fact… don’t check what they’ve posted at all… we’d love to see you take a stab at all of them. Some of these are quite difficult. You can use the A-Z page for reference. No human being can keep a roster of 300+ posts in their mind at once, so use the tools available! ***Amb has to wait until 1pm Pacific time to give her answers. *** Just to keep it fun for everyone else 🙂 I have a feeling she’d crush all of us – perhaps even me, and I came up with the questions. Sorry, babe 🙂 It’s a sign of respect for your awesome funny names and pop culture knowledge. 1. The first name of my all-time favorite funny name (and our first ever post); and a Simon and Garfunkel ode to structural engineering. 2. A Terminator Salvation actress; and a Beach Boys song about excitations. 3. The first person ever to reach out to us after being featured in our blog; and a timeless classic by the Old Crow Medicine Show and Critter Fuqua, (with some help from Bob Dylan). 4. Fannie’s post about a famous songstress that inspired a BoFN figure of speech; and a Shania Twain classic about gender identity. What’s this? Just an adorable picture? … or perhaps it’s a clue? 5. Rob’s first post – about a baseball player (surprise!) whose name inspired a legendary 1970 song about funny-named baseball players; and a British band from the 70’s who sang about the summertime and whose name was inspired by a T.S. Eliot poem. 7. A vivacious and quotable actress from the early-to-mid 1900’s whose dying words were “Codeine… bourbon…”; and an Alanis Morissette song about how she couldn’t help falling… it’s all your fault! 8. Arto’s post about an American railroad pioneer; and Sheryl Crow’s ode to good times. 9. My first obituary post, in tribute to a recently-deceased raconteur of all things boxing; and Fall Out Boy’s breakthrough hit, whose chorus hinged on a boxing-related refrain. 10. Another of Arto’s posts about obscure historical figures – this one about an American diplomat, politician and tobacco trader who was married to the also-well-named Louise Barbe Vanderclooster; and a U2 song about Bono’s inability to live in any circumstance. I hope you enjoy this fun little diversion, and please feel free to chime in with your answers in the comments section! I’d love to hear from you. Some of these were pretty tough, so I wish you luck! I love your brain, have I told you that lately? See you at 1pm Pacific Time, xo. Oh, I have it. I absolutely hate that song, by the way. Van Lingle Mungo Jerry. Utterly idiotic lyrics. A song with the line “have a drink, have a drive” could only have made the top 40 before the advent of MADD. 3. Crescent Dragonwagon Wheel? If so, brilliant. 6. Ever Andersonny and Cher? Haha, your mind, Dave, your mind! That’s all I can do without consulting the a-z. I’m drawing a blank on all my historical figures. Unless it’s Julius Kruttschitthefirstcutisthedeepest. Haha. It’s my curse for not knowing any Fall Out Boy songs. Sure, those innocent days of youth etc.! Are you a Shania Twain fan? There’s a belter-related one that has your name on it! Yes, I am a Shania Twain fan. I would love to write about her. Sounds like an amazing weekend was had on your end! Congratulations on the award–that’s awesome, but not surprising 😉 Of course you’re the best grad student ever. Who else could possibly compete? the award committee made a terrible mistake if they did not give the award to you. (you not yet being a grad student is inconsequential here) Hadn’t realized you were an undergrad–this changes everything! I AM old enough to be your mom 😉 Does amb know? This makes her a bit of a Cougar. lol. Appreciate the sympathy–thanks. And how awesome it would be to get the headache thing figured out. happy early birthday then and phew–this means older sister still works. No wonder you’re so well-versed. You’ve done quite a bit for just shy of 27 years. LOL! If I was drinking coffee right now it would have come out my nose. Well done, Liz! I don’t know any of the answers, but that is one mongo quiz! I just gotta step back and gasp in awe.